This Traditional Wooden Crockery Almirah has a elegantly made Showcase with multiple racks that can be of wood or glass as per your need, with a closet beneath the showcase for other home and kitchen articles. The design is simple yet attractive. The sleek pull out style drawers, traditional cabinets with single door panels and brass handle makes it a treat for sore eyes. 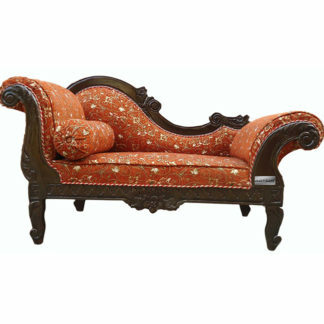 The unit is handcrafted in Sheesham also known as Indian Rosewood by skilled craftsmen from Saharanpur India. The designer Arch in front with simplistic finish make it a perfect match ; not only for traditional makeovers, but for modern homes as well. 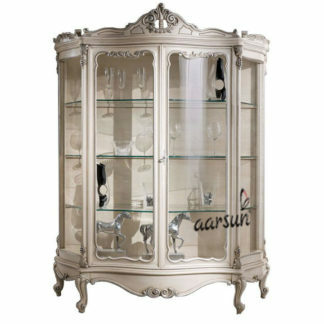 Aarsun Woods excel in customization and have been in Handcrafted Furniture business for quite some now. The Crockery Almirah can be made exactly as per your home requirements. the design, the size and even the shade can be altered depending upon your home interiors. Chat with us or call us now at +91-8192999135 / +91-8266888634 (WhatsApp Available on Both) for exact delivery time-frames and customizations. 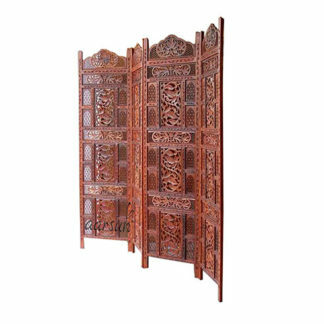 Aarsun Woods Traditionally Hand-carved Wooden Crockery Cabinet are also available on popular e-commerce portals such Amazon India, Pepperfry, Indiamart….